Carp's Corner: In the wake of yet another controversial season, we are again faced with the question: Should Goal Line Technology be used in Football? In the wake of yet another controversial season, we are again faced with the question: Should Goal Line Technology be used in Football? In Football, a matter of millimetres can determine a winner and a loser, which in modern sport has huge financial implications. As the statistically proven most popular worldwide sport, surely it is time for FIFA to face the facts and introduce a system which has the capability to avoid the persistent controversy induced by the errors of officials. With the technology we have at our disposal and the vast amounts of money associated with football, is it time for FIFA to step up to the plate and answer the pressing calls for goal line technology? An estimated 700 million people witnessed the 2010 World Cup Final, making it one of the most watched sporting events in history. However, one of, if not the most, dominant talking points to be extracted from the tournament – especially in this country – was that associated with goal line technology. This was in the wake of England’s exit from the tournament following defeat to arch rivals Germany, as the game was over shadowed by an incident late in the first half. With England trailing 2-1, Frank Lampard’s long range effort appeared to cannon down off the crossbar and over the goal line. However, the jubilation of English supporters soon turned to despair as the linesman failed to spot the ball had crossed the line. England went on to lose the game and, in a country where football is worshipped, cries for goal line technology came to the surface. These pleas were and still are understandable, as it would seem that the mistake made by the officials could have easily been avoided by taking a few minutes to review the incident with the aid of goal line technology. This, unsurprisingly, was not the first time there had been controversy surrounding a refereeing decision in a decisive football match. As a matter of fact, Geoff Hurst’s infamous ‘goal’ for England against Germany in the 1966 World Cup Final remains one of the most controversial moments in football history. Furthermore, in the crucial World Cup qualifier between France and Ireland, the officials failed to spot a blatant hand ball by Thierry Henry in the build up to France’s decisive goal. This cost Ireland a place at their first World Cup Finals since 2002 due to the error of an official. Following each of these incidents, what followed was uproar in the press claiming that inept officials are unable to make the pressurised decisions in big matches. However, it is impossible to lay the blame directly at the feet of the officials. The job that the men in black have to do is underestimated, and part of the blame must be directed at those in charge of football. In fact, when Lampard’s ‘goal’ was not given, rather than criticise the officials, the words of commentator Mark Lawrenson were ‘Thank you Sepp Blatter’. Football has reached a stage where FIFA President Blatter and UEFA President Michel Platini can no longer ignore the evidence and must help officials by introducing some form of goal line technology. 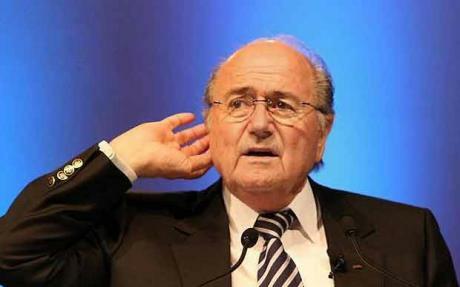 Sepp Blatter - Time for change? Several methods of goal line technology are currently under scrutiny by FIFA as the organisation begins to extend its search for a suitable solution. The Cairos GLT system is one of several proposed methods, and was in fact tested at the 2005 U17 World Championships. Put forward by Adidas and Cairos Technologies, the system uses cables installed in both the penalty area and behind the goal, while sensors in the ball will detect when it has crossed the line. Although if carried out correctly, this may seem like a reliable and efficient method, testing showed that the Cairos system is not as accurate as one might expect. This suggests that there are still gaps in the technology which need to be filled before it can be considered as a solution. A further suggested method of goal line technology is Hawk-Eye, which has already seen success in both tennis and cricket. The system would involve placing six cameras in the stands at each side of the football pitch providing visual images and timing data in order to show whether or not the ball has crossed the line. Although this is considered a reliable and efficient method, it is also a very costly one at a price of £250,000. Hawk-Eye has also been criticised for slowing down the game as the referee will need to take time to review the footage of a goal line incident – although this seems a small hindrance for a method which will reach the correct decision in all incidents of controversy. Hawk-Eye does, in fact, seem like the most appropriate method to introduce, as goal line decisions will be confirmed in a matter of seconds, and has been supported by an FA Premier League Spokesman who stated that “We think Hawk-Eye is the right blend of simplicity and technology”. Indeed, there are many issues associated with goal line technology which could hamper its progress in the near future. The sheer cost of the suggested methods is something acting as a significant barrier to the introduction of goal line technology. Although it may seem like only a few pennies to the giants of football such as Manchester United and Barcelona, is it realistic to expect the likes of Rotherham and Yeovil to fork out vast amounts of money on goal line technology, when they see it being better spent elsewhere? There is perhaps, a solution to this problem. 70 year old Mark Robberts has devised a system which will involve little more than a shovel and will avoid the commotion surrounding the cost of goal line technology. Robberts’ suggested putting a slope immediately behind the goal line, so that if the ball bounced over the line it would bounce back into the net. With such a simple, costless method one might wonder what the need is for such expensive methods of goal line technology. Robberts’ system would not only eliminate the high costs of goal line technology, but also make it available to lower level clubs and school football. While this might seem like a flawless suggestion, Robberts’ proposal was rejected by FIFA on the grounds that it would only solve the problem of the ball bouncing down off the crossbar, while the issue of the ball rolling over the line would still exist. One of the key issues with goal line technology is the fact that it delays the game. Football is known as a fast paced and exhilarating sport, and there are concerns that the time taken to review a goal line incident may disrupt the rhythm of a football match. However, the short delay of reviewing a goal line event may seem a small price to pay for reaching the correct decision. Sepp Blatter and Michel Platini have been most reluctant to bring in goal line technology for the simple reason that football is an uncomplicated game. Football has gained its popularity through being very easy to understand while there have been minimal changes to the laws of the sport. Human error has been a part of football since it was first introduced, and the controversy associated with the mistakes made by officials contributes towards the excitement of the sport. Therefore, the reluctance of Blatter and Platini may appear understandable as they are unwilling to change a successful formula, and as the saying goes, “If it isn’t broken, don’t fix it”. However, football has now got to a stage where the errors of officials are dominating the headlines. Goal line technology will not only ensure that the football is the main talking point, it will eliminate human error from the game so that referees will not be hounded by the press for their mistakes. Goal Line Technology will have a high success rate no matter what method is employed, and will only help football by ensuring that the right result is achieved. Many football matches are decided by a solitary goal, and for that to be taken away by a poor refereeing decision is extremely costly. Consequently, the reliability and success of goal line technology will be essential in ensuring that the correct decisions are made. Many alternatives to goal line technology have been tested by FIFA, including adding an extra official in line with the goal to help the man in the middle make the big decisions. However, this system is still flawed being vulnerable to human error. With so many failed systems falling through the net, it must be time for FIFA to open their eyes to goal line technology. Football has got to a stage where there is too much money involved for a team to be undone by the crucial mistake of officials. It is time for FIFA to step in and give referees the help they need to ensure that correct decisions are made, whether it is at the top level of the sport or all the way down to lesser clubs – goal line technology has to be introduced one way or another. It’s reliability and accuracy makes it a relatively risk free option which is raises the likelihood of its overall success. The least FIFA could do is to test goal line technology for one season and then make a decision as to whether it is the correct path to follow. Although the likes of Blatter may have qualms about introducing goal line technology, it is the only way to prevent farcical incidents such as Frank Lampard’s ‘goal’ at the World Cup from happening again. The Sunday papers should be praising great matches, not criticising the mistakes of match officials. For this to happen and for football to progress, FIFA must now step up to the plate and use the wide diversity of available technology to implement a reliable and successful system to make the controversy surrounding football a thing of the past.